I have been commissioned to paint all kinds of things! 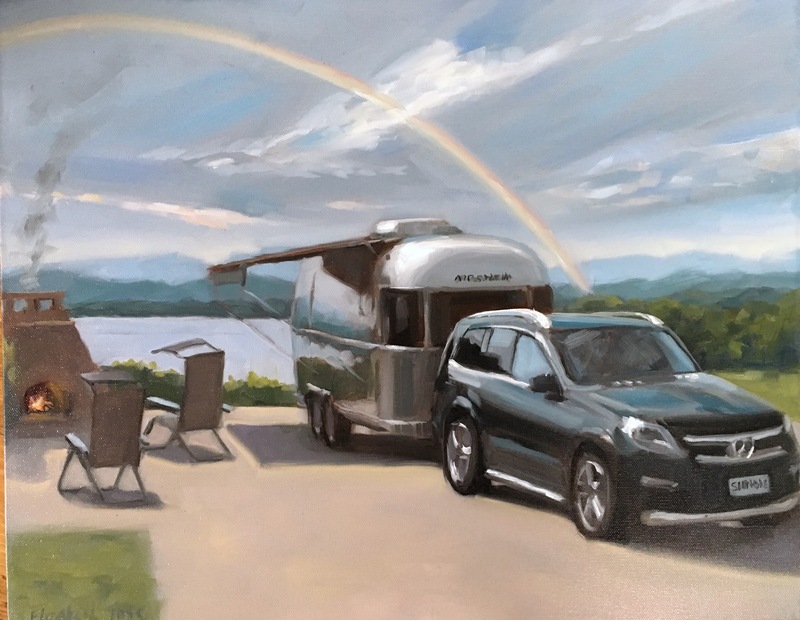 My most common requests are for paintings of people's Airstream trailers in their favorite spots or for portraits of themselves or family members, from life or from photos, sometimes deceased relatives. I've also been asked to paint pets, vintage vehicles, steam trains and favorite views. I've had some wonderful interactions with my collectors, designing together these special projects, suggesting ideas, coming up with compositions and solutions and then to hear about their pleasure in getting to hang their piece in pride of place. It's very satisfying. Please do contact me if you have a project in mind. Here is a portrait commission from start to finish. My client loved the candid photo of her niece and how it expressed her personality. 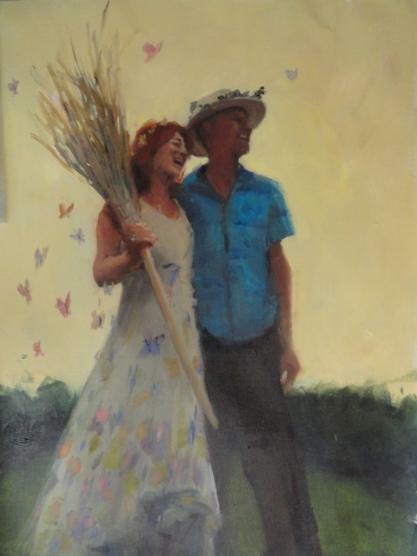 replace the busy background with an impression of blue sky - the hat was worn for an outdoor event. simplify the pattern of the dress. I slipped it into a frame when the client came over to see the painting finished but made suggestions for what kind of frame would work better with the painting. She was delighted with how it all came out. Your portrait commission starts with a full consultation to help me understand what you have in mind and to agree on the parameters of the finished piece. Portraits are painted over 2 to 3 sittings of about 2 -3 hours each and I work in between times using photographs that I take on the first sitting. I can also work entirely from photographs for a surprise gift or a deceased friend or relative. I can also paint your classic vehicle or airstream trailer in a setting of your choice. Each additional person in the portrait is $1,000. I can also work entirely from photographs. By commissioning me to paint your commission, you are agreeing that you are choosing my style and artistic aesthetic and will trust me to make the majority of the creative decisions about the piece. That the finished artwork would sit congruously amongst my full body of work. That once I have started painting, there is no more consultation or adjustments to the agreed upon brief and I decide when it is finished. Thank you. Here are some recent commissions of Airstream trailers. Click on the thumbnails for a larger view.